Worldwide, more parents are opting for immersion pre-schooling for their children in order to benefit from its linguistic, educational, and cultural benefits. This immersion can be either bilingual or monolingual, aimed at early second language learning, or at language maintenance – offering minority language children mother-tongue support and enrichment. 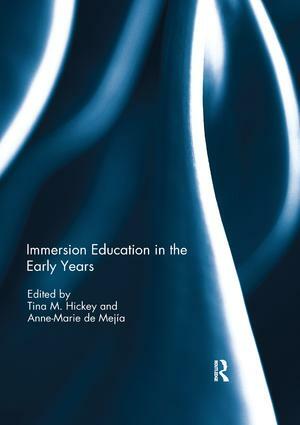 This book examines some of the key issues and policy concerns relating to immersion education in the early years. The term itself can be difficult in some political contexts, as can the differing outcomes noted by studies comparing monolingual programmes, and bilingual programmes for minority language children. The importance of training in immersion methodology for educators is discussed, as is the need to adapt preschool pedagogical practices to the immersion context, in order to provide optimal input for young language learners. One of the most pressing discussions surrounds differentiated provision – ensuring that the varying needs of children with language impairment, typical second language learners, and mother-tongue speakers with significant socioeconomic or linguistic disadvantages are all met. Overall, the book explores the challenges currently facing the sector, particularly with regard to training and professional development for practitioners, and the provision of appropriate materials in less widely used languages. Given the documented benefit of high quality immersion pre-schooling, this book fulfils an urgent need to increase the recognition of the sector. This book was published as a special issue of International Journal of Bilingual Education and Bilingualism. Tina Hickey is Senior Lecturer in the School of Psychology at University College Dublin, Ireland. She has published extensively on immersion education, bilingualism, first language acquisition of Irish, and reading in a second language. Awarded a Government of Ireland Senior Fellowship (2008), she has served as President of the Irish Association for Applied Linguistics, and the Reading Association of Ireland, of which she was made an Honorary Lifetime Member (2011). She is the author of Early Immersion Education in Ireland (1997) and Luathoideacheas trí Ghaeilge sa Ghaeltacht (Early Education through Irish in the Gaeltacht) (1999). She is the editor of Language, Education and Society in a Changing World (with Jenny Williams, 1996), Literacy and Language Learning: Reading in a First or Second Language (2006), Learning to Read and Reading to Learn (with Eithne Kennedy, 2006), and Multilingual Europe: Diversity and Learning (with Charmian Kenner, 2008). Anne-Marie de Mejía currently working at el Centro de Investigación y Formación en Educación (CIFE) at Universidad de los Andes, Bogotá, Colombia, where she is the Director of the Ph.D Programme in Education. She was previously the Director of Postgraduate Programmes in the Linguistics Department of the School of Language Sciences at Universidad del Valle, Cali, Colombia. Her research interests include bilingual classroom interaction, the construction of bilingual curricula and processes of empowerment, and bilingual teacher development. She is the author of a number of books in English and Spanish, including Power, Prestige and Bilingualism (2002), Forging Multilingual Spaces (with Christine Hélot, 2008), Empowering Teachers across Cultures (with Christine Hélot, 2011) and Bilingüismo en el Contexto Colombiano (with Beatriz Peña Dix and Alexis López, 2011).